Rice Recipe - Use Your LOAF! Rice Recipe – Use Your LOAF! 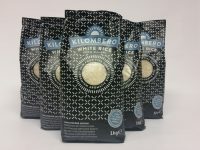 We re-launched the 90kg Rice Challenge in September and working with festivals, churches, schools and Fairtrade groups we have already sold 243kg of Kilombero Rice. THANK YOU! “The last Fairtrade Penistone newsletter introduced the idea of using your LOAF (Local, Organic, Animal-friendly, Fairtrade) ingredients when cooking. That needn’t just apply to baking cakes! Here is a recipe which uses that Fair Trade rice – it’s quick and easy to prepare, great for a mid-week meal, and tasty and filling. Being vegetarian it’s also animal-friendly! I use home-grown vegetables when possible, they are organic with a small ‘o’ as we garden organically but we aren’t certified! If using fresh beans, prepare them and cook for a few minutes, drain. Save washing up by re-using the pan for the rice! Wash the rice, drain and put in a small pan with 300ml boiling water. Bring just to simmering point and simmer over the lowest possible heat for about ten minutes, till all the water has been absorbed and the rice is tender. Fluff up with a fork. Meanwhile heat the oil, add the onion and garlic (and courgette if used) and cook gently for a few minutes till the onion is transparent. Turn the heat right down, stir in the paprika and leave for a minute to cook. Add the canned or fresh beans then the tomatoes and herbs. Stir very well to incorporate the paprika then simmer gently for 10 – 15 minutes until the vegetables are tender.